Ibises are such unusual looking birds, with their long, curved red beaks. I've been on a "birdy" kick lately with my herons and egrets. I decided to add a few more. This was done on 9x12 Art Spectrum paper. 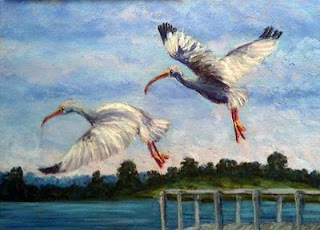 I used a reference photo I took this past December in North Carolina, when a large flock of 11 white ibises came in for a landing right alongside the waterfront where I was going for an early morning walk.